Heavy tanks have become too expensive, complex, heavy, vulnerable, and logistically unsustainable on the modern battlefield. The latest American M-1 tank costs $20 million, weighs 70 tons, requires a fleet of trucks to supply fuel, and is unable to engage most threats. Heavy tanks are armed to fight other tanks and unable to engage aerial threats, yet remain common in modern armies because Generals rose in established institutions whose primary goal is self-preservation, which means keeping the same types of equipment and organizations to ensure support from politically powerful military contractors. As a result, the US military has shown little interest in fielding modern ground-based Anti-Tank Guided Missile (ATGM) systems because the Army's Armor Branch finds their capabilities disturbing. Modern heavy tanks have limited secondary armament because most space is needed for a big 120mm cannon system. ATGM launchers are far smaller and lighter, which are the obvious choice for a light tank, as I explain in this article: Helltank about a missile firing tank that can knock out any heavy tank. It may not penetrate thick frontal armor, but the blast knocks out tanks and requires depot level repairs. Lockheed-Martin developed a Hellfiring LAV called the DAGR with an impressive telescopic sight, but the US Army showed no interest. Tanks are huge, lumbering machines and easy targets for modern precision weaponry. Most hits from an ATGM cannot destroy a heavy tank, but can put them out of action for weeks if depot level repairs are required. Moreover, tanks are armed to destroy other tanks and have little defense against modern threats like: attack aircraft and helicopters, ATGMs, unmanned aerial vehicles (UAV), and infantry with shoulder-fired rockets. Tanks remain in large numbers because modern anti-armor tactics employing modern anti-armor weaponry have yet to occur on a large scale that would show them obsolete. Losses of tanks during minor clashes with insurgents are rarely reported, but hundreds of examples can be seen on youtube. Most Generals refuse to accept the tank is dead because recent engagements have been limited to sporadic attacks. Countermeasures have been developed, but they cannot provide total tank protection against the varied types of ATGMs that may arrive from any direction. Even if a tank can confuse, destroy, or resist an ATGM, another is inbound, and then another. In the past, tank crew survivability was emphasized with the logic that vast stores are available to quickly replace tanks lost in combat. However, there are few modern tanks kept in a ready-reserve status because costs are now so high. Repairing complex armored vehicles can require weeks of depot level work. Small anti-armor weapons are so powerful that heavy tanks can be destroyed by a foot soldier. The first of such weapons was the German Panzerfaust that appeared toward the end of World War II. (pictured) This simple weapon only required the user to arm, point, and shoot. It could knock out most tanks of its era, albeit only at close range and with a flank shot. The first popular man-portable ATGM was the Soviet wire-guided Sagger. These appeared in Vietnam in 1972 and startled everyone when they knocked out several M-48 Patton tanks. During the short 1973 Yom Kippur war, Saggers knocked out more than 800 Israeli tanks and other combat vehicles. Over the next three decades, dozens of better types of ATGMs were fielded. 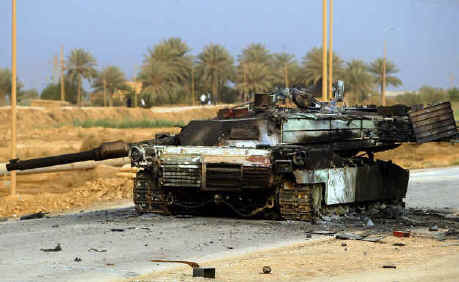 During the first Gulf War, Iraq's tank centric army was easily destroyed since tanks were unable to engage attack aircraft and helicopters. During the 2003 American invasion, an Iraqi armored company attacked two dozen American special forces commandos. Their new Javelin shoulder-fired ATGM destroyed most of the Iraqi armor and the rest withdrew. During the brief 2006 Israeli attack into Lebanon, 45 Israeli heavy tanks were knocked out by ATGMs. Israel states 43 of these tanks were rebuilt and returned to service. That sounds impressive, but they were still out of action for weeks and resources were needed to recover and repair them. Here is an interesting documentary about problems Israel's Merkava tank encountered as ATGMs improved. The Soviets developed the highly successful RPG after World War II. These simple rockets knocked out over a hundred American M1 heavy tanks in Iraq. Tankers note that most RPG hits caused no serious damage, but these were older RPG-7 rockets. The later model RPG-29 is larger (pictured) and really a bazooka that made a very limited appearance in Iraq where it terrified US Army tankers when it sliced through their side armor. American Generals refused to allow the new Iraqi Army to purchase RPG-29s fearing they would fall into enemy hands. Over the past few years, larger ATGMs like the Russian Kornet and American TOW devastated Syrian armor and led to a stalemate. The most deadly ATGM is the video-guided Spike produced by Israel. The US Army developed a similar video guided missile but Generals refused to field them. There are several good videos on youtube showing these missiles in action. South Korea recently fielded a great video-guided fiber optic missile and even the Philippine Army acquired a smaller system, yet the USA ignores this revolutionary weapon. Advances in lightweight batteries now allow the production of cheap UAVs that are the newest threat to tanks. Any military lab can affix an anti-tank warhead to a commercial UAV sold in toy stores. These can crash into a tank's rear or hover above to detonate a downward charge. Video-guided missiles and UAVs like the new Switchblade (pictured) can maneuver to strike the top or rear of a tank where armor is thin. The US military has not accepted the simple idea that cheap COTS UAVs can be modified to become devastating weapons. The Russians recognized this and already fielded an anti-tank UAV! It may seem simple to just shoot down small UAVs, but watch these yahoos trying to shoot down UAVs, which fly low because shooting at targets above is nearly impossible. Think about trying to shoot at one at night or in fog, or if twenty appear at once! An enemy might coordinate a mortar barrage to keep everyone under cover whilst UAVs appear overhead. Or they might send $200 UAVs zooming around as decoys to draw fire and exhaust ammo before more sophisticated UAVs arrive. The biggest problem is that small UAVs are quiet and difficult to see on radar. They can't be heard until nearby, and only if loud tank engines are turned off. Moreover, units cannot standby 24/7 ready to shoot down UAVs. Tankers will know that UAVs are attacking when tanks start exploding! UAVs can fire small projectiles downward into a tank's thin top armor, or they can crash into tanks with an anti-armor warhead like this new Turkish kamikaze UAV. A sophisticated enemy might jam wireless UAVs, but this can be countered with a tethered thin wire version just like some ATGMs use. Unless a magical new armor is developed, ATGMs and UAVs are now so deadly that employing large ultra-expensive tanks to attack an opponent with modern anti-armor weapons is foolish. Critics note that modern armies have a limited supply of these expensive munitions that will be quickly exhausted in wartime. That is correct, so armies need to build up stockpiles, which are easily affordable once most ultra-expensive tanks are retired. 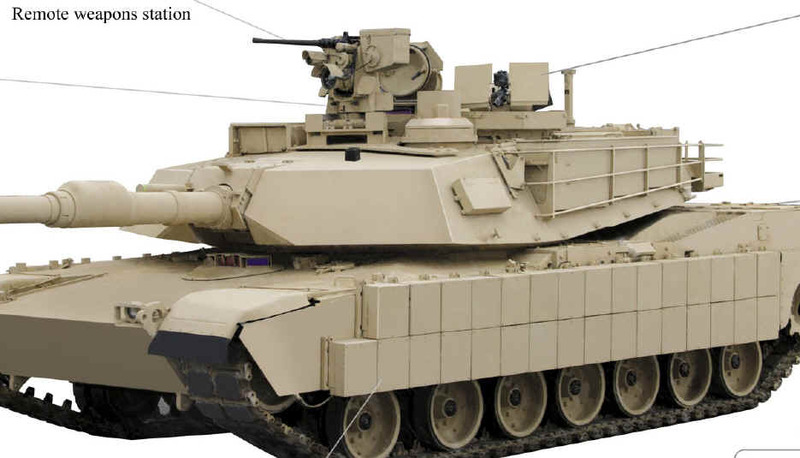 The industry solution to preserve the tank are two impractical concepts that each add another thousand pounds of weight -- Reactive Armor and Active Protection Systems (APS). Here is an excellent short video about reactive armor. This seems like a great idea, but only if tanks operate alone. The counter explosion is large and will kill anyone outside, damage nearby friendly vehicles, and terrify the crew. In addition, no one discusses what happens when a row of reactive armor is sprayed with autocannon or heavy machine gun fire. These cannot be turned off when operating near friendly infantry, who will refuse to go near tanks once several are killed by a reactive blast. Moreover, reactive armor only protects some of the tank. This short video provides an excellent overview of APS, now being sold as a savior for tanks. This outstanding article provides greater details. APS has the same problem as reactive armor - friendly casualties. Nearby tanks may suffer damage as their reactive armor and APS systems trigger each other in a chain reaction. In addition, APS is easily damaged in combat from shell fragments and bullets, and from environmental factors like main gun blasts, rain, ice, tree branches, dropped tools, and boots. 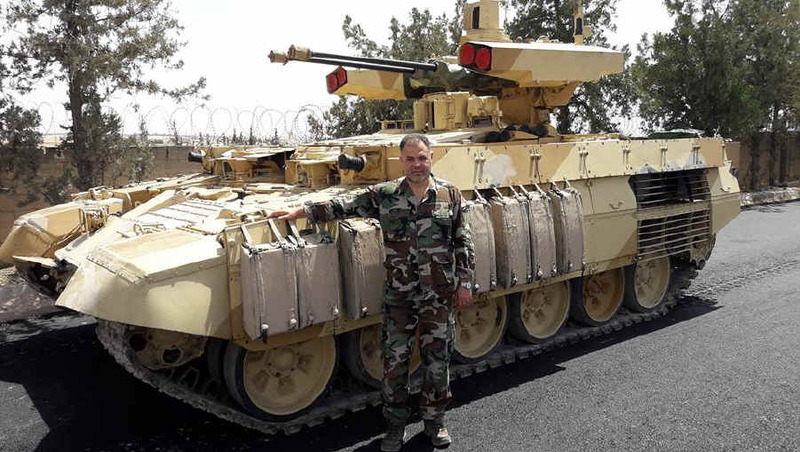 Despite industry claims, it may be triggered by birds, dispensed smoke canisters, flyer plates from reactive armor, projectiles from other APS, and enemy artillery and mortar rounds. Enemy autocannon fire and grenade launched projectiles will also trigger firings and quickly exhaust APS counter-munitions. Another weakness is that APS can only engage one target every few seconds because the destructive blast blinds its radar. Infantry will learn to fire two rockets or ATGMs at nearly the same time, so one will hit. There have been no major battles between forces equipped with these systems so one can only debate the results. Realistic testing could provide great information, but does not occur because Generals and influential military contractors are not eager to learn if expensive APS actually works and if tanks are obsolete. APS have been proven successful in simple tests and against individual attacks by insurgents. Nevertheless, rational thought proves these systems dangerous to friendly forces and easily overwhelmed by projectile chaos on the modern battlefield. This is why the US Army and Marine Corps expressed no interest in the these systems until recently. The tank-infantry assault team concept remains strong since World War II where infantry provided all around protection from threats to 35-ton M4 Sherman tanks armed with a 76mm main gun. (pictured) However, this concept began to fade when the bigger Pershing tank arrived on the battlefield in 1945. Infantrymen were happy to see an American tank that could match heavy German tanks, but there were many accounts from infantrymen who said the blast of its 90mm gun would knock them out. Over the next three decades, American tanks grew to the massive 70-ton M1 tank of today. (pictured) The blast from its 120mm gun is so dangerous that soldiers must remain behind the tank when it fires. It has a powerful engine that allows great acceleration, which frightens infantry who fear getting run over. In addition, the tank is too tall to see over and its gas turbine engine emits so much heat that soldiers cannot follow behind for protection. As a result, the dangers APS and reactive armor pose to supporting infantry can be dismissed because M1 tanks are already too dangerous for friendly infantry to fight alongside. Yet without infantry, tanks are vulnerable to surprise flank attacks by enemy soldiers armed with shoulder-fired rockets and small video guided missiles. If APS improves and becomes effective, it can be countered with a simple tactic. 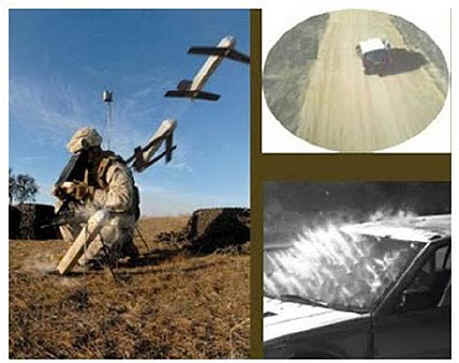 The issue is how these systems deal with incoming artillery and mortar fire, which are far more accurate as cheap UAV spotters proliferate down to the battery level. APS can't distinguish between cheap dumb munitions and expensive smart munitions. In addition, artillery and mortar impacts and throw up large chucks of earth and debris that seem like incoming projectiles on radar. APS can be turned off until truly needed, but that point is unknown. So the simple tactic is to fire an artillery or mortar barrage to exhaust APS (or force tankers to switch them off) then follow with expensive video-guided missiles and UAV anti-tank kamikazes. However, smart artillery and mortar munitions can slay tanks themselves. The Swedish 120mm STRIX with an infrared seeker was fielded two decades ago but found few buyers, probably because Generals see them as threats to their tanks. Mortars are best to employ sensor-guided munitions since they have a low launch velocity so the g-force exerted is far less than from a gun or howitzer so the problems with electronic seeker damage are much less. In addition, since a mortar round falls straight down it allows a seeker a better and longer view of the target below, whereas a howitzer round arrives at an angle. This is why 155mm howitzer-fired sensor-guided munitions like SADARM and BONUS require a complex cargo projectile that breaks open in flight and releases smaller sub-munitions that have less penetrating power than a 120mm mortar round. These sub-munitions could be easily adapted to fire from a 120mm mortar, as well as aerial "bomblet" munitions like the tank engine acoustic seeking BAT. Since APS broadcasts a continuous radar signal, a radar seeking mortar round would end their use. A serious effort to develop a variety of 120mm anti-tank mortar munitions would doom the tank too! Here is a great overview of high-tech mortars: Mortar Ammunition: an International Survey. Countermeasures to decoy these mortar rounds help, but a barrage of different types would ensure that a sizable number hit targets. In summary, a mortar barrage that includes smart anti-tank rounds can exhaust APS and wreck an armored force, then video-guided missiles and kamikaze UAVs can follow to destroy surviving vehicles. 1) An narrow opening and vulnerable area in one's armor that the opponent will usually aim for. This term relies on "chink" in the sense of "a crack or gap," a meaning dating from about 1400 and used figuratively since the mid-1600s. Look at the "invincible" frontal profile of a modern American M1A2 tank with extra TUSK protection (pictured with new reactive armor along its sides). Few express concern about the exposed aiming systems and unprotected secondary armament. Broken tracks or road wheels can down a tank for hours. The main gun can be hit and a lucky shot may hit the turret ring and penetrate. Tanks encountering infantrymen, armed with large numbers of simple shoulder-fired anti-armor rockets or rapid-fire 20-40mm autocannon, will encounter a blizzard of projectiles that set off reactive armor and APS and cause damage. Finally, while larger, long-range ATGMs like Hellfire, TOW, and Kornet are unable to penetrate the frontal armor of heavy tanks, their impact causes a massive explosion that always puts the tank out of action. There are hundreds of youtube videos recorded the past few years that show heavy tanks like the M1 being blasted and disabled by an ATGM. Yet another threat to tanks are Self-Propelled Anti-Aircraft Guns (SPAAGs). These are key weapons on the modern battlefield to destroy threats like: attack aircraft, attack helicopters, incoming ATGMs, UAV, and infantry with shoulder-fired rockets. SPAAGs are armed with one or two 20-40mm autocannon and some mount a few anti-aircraft missiles. Here is a good video overview of modern SPAAGs around the world. Note that the US Army has none! Generals retired the M163 VADS in 1994 while other armies wisely kept them in service. Watch South Koreans fire this system at ground targets and imagine an armored force encountering that 20mm hailstorm. The US Marine Corps developed an impressive anti-aircraft LAV with a 25mm gatling gun and Stinger missiles. The vehicle was expensive since only 17 were procured and it was soon retired as the Cold War ended. Generals didn't recognize its secondary value as an anti-armor weapon. Ironically, it used the same GAU-12 gatling gun found on the Marine Corps AV-8 Harrier that was promoted as an anti-armor weapon. Watch this rare footage that shows what a 25mm gatling gun can do to a tank. In an encounter between a SPAAG and a heavy tank, the winner is whoever fires first, and a SPAAG turret turns much faster than a tank's. A tank cannon has greater range and fires a far more powerful projectile, but most encounters are at less than 1000 meters, and once a SPAAG starts hosing down a tank it will be disabled in seconds. SPAAGs are the most versatile ground combat weapon on the modern battlefield. They are an effective anti-infantry, anti-missile, anti-UAV, anti-IFV, anti-APC, anti-tank, anti-helicopter. and anti-aircraft platform. Helicopter and attack aircraft pilots fear SPAAGs. They can maneuver and use decoys to dodge a missile with its small warhead, but they can only pray when they encounter a SPAAG spraying hundreds of big dumb bullets. A unit with a mix of SPAAGs is probably best. 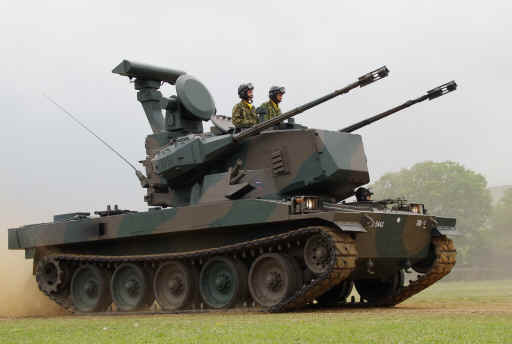 One armed with the proven radar-guided Oerlikon 35 mm twin cannon (pictured) or Bofors LVK90 40mm autocannon, and one with a 20mm or 25mm gatling and missiles. Both should also have a machine gun to provide close protection when needed. Missiles in the year 2030 will be even smarter with better warheads than today's ATGMs. The dominant role of the tank on the modern battlefield will be replaced by two specialized systems. The SPAAG is the obvious new primary ground combat vehicle given its multirole capabilities, like gunning down incoming ATGMs and UAVs. However, SPAAGs are too expensive and lightly armored to engage in close combat as part of the needed tank-infantry assault team. A much smaller, simpler, heavily armored infantry support vehicle is needed for this role, which I dubbed "Rhinos" in my book. These can be supported by SPAAGs following at a safe distance to provide overwatch for aerial threats. Retiring tanks is now discussed in reports that Norway may shed its heavy tanks. That is wise if they plan to fight only defensive battles, but armies also need heavily armored vehicles like Rhinos to assault enemy positions. Heavy armor is still needed, it is the big single-shot 120mm cannon that makes the tank obsolete. ATGMs can fill that role and leave room for an autocannon needed to engage modern threats. Russia learned this during its recent Islamic conflicts, including fighting in Syria. Infantry were unable to fight alongside T-72 tanks with the blast of its 125mm gun and reactive armor danger. A hybrid was developed using the heavily armored T-72 tank chassis and dubbed the BMPT "Terminator". (above) Rather than a big cannon, it has dual 30mm autocannon, a machine gun, and two 30mm grenade launchers. BMPTs can provide far better direct support near infantry without the dangerous blast of a 125mm cannon. It is also lighter and less costly to produce and support than a tank. However, the Russian military has not embraced the BMPT because most Generals see it as a threat to their industry friends. Meanwhile, several were sent to Syria because that is what Russian officers there said is needed. They don't need expensive tanks designed to destroy other tanks. They need a multi-role fighting vehicle that can fight alongside infantry and destroy all modern threats. The tank is dead! The fact of the matter is that tanks are dinosaurs. They really should have been pulled from the front lines years ago but because they represent a technological 'epoch' they have a use in keeping the competition restrained to a specific class limitation of performance to which basic improvements in the three primes of protection, mobility and firepower render the system easy to upgrade. There is also a considerable institutional inertia, at least in the U.S. Army center around heavy-tread systems. What Shinseki I think it was did when he wanted to go to the wheeled 'light brigades' is threaten to make public an image of a LOSAT which, fired 8 at a time from a Hummer, went in the front grate and out the back engine grill of an M1A2. This is the reality of LOS warfare, in that, if you can sustain the speed of the round at the muzzle (via rocket propulsion), there is not a tank on the planet which can withstand any of the modern 120-125mm rounds. And using the concept of a Modern ONTOS (LOSAT has been killed by politics by CKEM can go on systems as small as a robotic MULE) you can guide eight shots before the first enemy round hits you. And this is the critical reality we are talking about here. Because it's not the first minute that counts. It's the first 10-15 seconds which decides tank combat at anything under about 2,500-3,000m these days. Everyone (including the Russians) have modern fire control and decent rounds. Such that anybody shooting that gets a hit is likely to get at least a mission kill as the turret jams or the vehicle stops moving. If a missile carrier can fire 8 rounds in 10 seconds it beats 8 tanks with manual loading or 4 tanks with autoloaders and it does so at distances beyond that which their own kinetic energy penetrators can guarantee a hit. If you cannot beat the rapid fire, cheap, solution at LOS distances. And you cannot bring enough tanks to beat an enemy equipped with T-90 or Leo-2A6 to a distant theater quickly enough, then you had better go for an alternative 'netcentric' approach which puts the shooter into NLOS and saturates any Automatic Protection Systems with MRSI simulshots. We could do exactly this, begin killing enemy tanks in maneuver warfare SOONER and FASTER that could be achieved with direct fire systems. But we would first have to show that these thin skin, easily deployed, easily hidden, bushwackers can also survive 4th generation warfare against whomever we label insurgents, fighting with RPG at <200m distances. 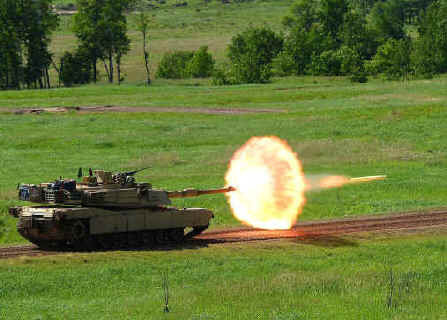 The irony then becomes that in a role for which they are not optimized, tanks remain able to soak a lot of desultory fires with minimal damage gen-after-next 'light' systems are better at open field maneuver warfare. If we could bring small scale Wiesel type robotic vehicles into MOUT service with light cannon and ATGW atop minimally armored hulls in the 5-10 ton class, we could ditch tanks altogether and save HUGE amounts of money in yearly maintenance and training alone. But so long as it's high-tech vs. old-iron in street fighting, the tankers will snicker and keep their rides because, nominally, they are 'cheaper' to shoot up.